Andy Crouch. Strong and Weak: Embracing a Life of Love, Risk and True Flourishing. Downers Grove, IL: InterVarsity Press, 2016. 192 pp. $20.00. My co-worker’s subtle twist on the common expression wasn’t entirely a joke. For him, avoidance of risk and responsibility were a way of life. Although a seemingly wise modus operandi (who wants to be blamed when things go wrong? ), Andy Crouch argues in his book Strong and Weak that we were made for more than the easy life. God made us to flourish, to live “the life that is really life” (a beautiful refrain used throughout the book, adapted from 1 Timothy 6:19). But how do we get this good life, this life of flourishing? Additionally, if we were made to flourish, why do our lives so often not experience it? These are the two questions with which Crouch opens his book and seeks to answer throughout. It’s impossible to review Strong and Weak without mentioning the idea Crouch comes back to again and again. It’s the idea that flourishing is not choosing either vulnerability or authority, but rather seeking both. He uses a 2x2 grid to explain this concept, with the target quadrant (Flourishing) in the upper right. The three other quadrants (Suffering, Withdrawing and Exploiting) depict falling short of flourishing because they represent lives missing either vulnerability or authority or both. The book is easy to read and full of Christian themes and ideas, although light on explicit Bible verses. In this way, Crouch is like a confident tour bus driver who gently steers readers through the topics with his fingertips on the wheel, not clenched fists. A question evangelical Christians might have while reading Strong and Weak has to do with the extent to which our flourishing occurs in this life or the life to come (especially in some sections of Chapters 4 and 5). This is probably another case where “and” is a better word than “or” (this life and the life to come). Still, because the emphasis on the “now” is often front and center, a few times I found myself mumbling, to paraphrase Paul, If we are to flourish only in this life, we are of all people most to be pitied. The book’s main challenge for me was to keep my fragile heart invested even after it’s been hurt. That may seem easy, but it’s not. A leader can quit without quitting. We might not only pass the buck but quit caring about it. And sometimes, when the demands of shepherding a church spike, I feel the temptation in our pastor-elder meetings to avoid sharing on a personal level, maintaining an air of indifference on agenda items when I’m actually not at all indifferent. In short, I feel tempted to become an armadillo—having a soft, vulnerable underbelly that I keep hidden from even my fellow elders. But this isn’t what we were made for—a life inside bubble wrap. We were made for risk and love and dominion and following God as He fills the earth with His knowledge as the waters cover the seas. This kind of flourishing requires Christians who neither withdraw nor exploit. 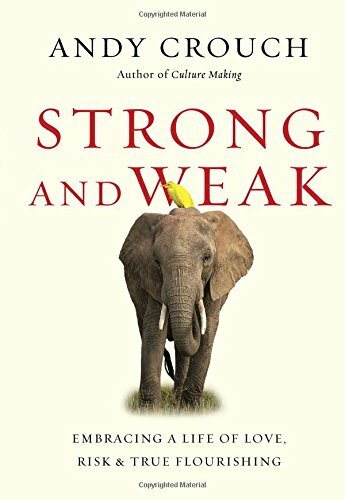 Strong and Weak is a good book to move further in and higher up. * This book review originally appeared at EFCA NOW.